This article was originally printed in Choral Journal as part of the October 2018 issue, permission was granted by ACDA to share here. Learn more at acda.org/choraljournal. I am the product of a K-12 Quaker education received at Germantown Friends School in Philadelphia. My Quaker education taught me to listen to and value diverse voices, to oppose and refuse to engage in war, to regard all people as equal in the eyes of God, to practice engaged activism, to value the consensus model of decision making, and to act in consistency with my values. As I set out for college, I knew I wanted to integrate those Quaker testimonies into my music practice and to bring what I loved doing into harmony with who I was. Quite simply, I wanted to live an undivided life. This celebration of identities and relationships resonates with me and represents the direction and dialectic of my choral work over the last forty years of servant-leadership. I came of age when the Civil Rights Movement was well underway, when the anti-war movement was burgeoning, when the women’s movement was gathering steam, and when LGBTQ people began to come out after the Stonewall rebellion. With these freedom movements spreading throughout the nation, I asked myself: could my music making serve the goals of justice, peace, equality, and radical social transformation? In these pages I want to share from my experiences in starting, from the ground up, nine choirs: three women’s choirs, four prison choirs, and two diverse interfaith, inter-generational, inclusive, community choirs. In each case, my choral activism has addressed the questions: What is missing and why? Can I make it better? How? My choral story starts in 1974 when I was taking a summer conducting workshop with Margaret Hillis in Chicago and staying with my friend Ann Gordon, who taught Colonial American History at Northwestern University. One evening I shared with Ann my desire somehow to tell the history of American women through song for the Bicentennial. When she suggested I start a women’s choir to relate women’s “herstory,” my response was telling: I simply was not interested. That I had seen, women’s choirs were conducted by men. Their repertoire was typically arranged from compositions for mixed-voice or children’s choirs, and it was either liturgical or full of sappy lyrics about flowers and birds or boy-meets-girl romance. Plus, there was the stigma that women’s choirs were populated by the sopranos and altos who had not made it into the more prestigious SATB ensembles. But Ann made a convincing argument, and she committed to spending the coming year researching historical women’s repertoire if I would agree to start a women’s choir right away, back in Madison where I was pursuing my master’s degree with Robert Fountain. So on returning to school I started Anna Crusis Women’s Choir, with thirty founding members. At the time I could not have known that this was the first ensemble in what would become a nationwide and enduring choral phenomenon. As I worked to program my inaugural women’s choral concert, I found myself asking several questions about what was missing: Why had the Church silenced women singers? Where were the women composers? Why was so little music written for the beautiful breadth and depth of women’s voices? Where was the significant repertoire that sounded the experiences of women’s lives or elevated the words of published women poets? In 1975 a teaching job called me back to Philadelphia. Determined, now, to continue conducting women’s choirs—and to realize with Ann our bicentennial herstory project—I brought Anna Crusis’s name with me and set out to recreate her. I plastered the city’s feminist, LGBTQ, and otherwise-alternative spaces and media with an announcement of the beginning of an auditioned, feminist women’s choir and of the women’s history folk opera that would be its inaugural project. (2) By this time, Ann and I had curated a collection of tens of songs that revealed the kinds of lives women led in the early generations of our country’s founding. In June of 1976, the seventeen members of Anna Crusis (Philadelphia) premiered Songs of American Women at the triennial Berkshire Women’s History Conference, held at Bryn Mawr College. Before the weekend conference was over, Anna had been invited to perform the folk opera at colleges and universities in New Jersey, New York, and Connecticut. Women historians, now enjoying support from their newly founded women’s studies programs, were excited to present this telling through song of the histories of American women. In this project of writing women back into history through singing, I had loved discovering the lullabies, work songs, suffragist anthems, love songs, and other descriptive and evocative materials about the lives of women. But to fi ll the void for mature women in community women’s choirs of well-crafted choral works relevant to their lives, I knew I had to commit to a lifelong practice: of researching, networking, and risk-taking; of collaborating with expert women practitioners in unfamiliar cultural styles; of arranging and commissioning significant works. I was determined that women of all ages might see their lives reflected in the music they sang. The new community women’s choirs sang folk, world, classical, and popular music, also featuring songs from the women’s liberation movement. 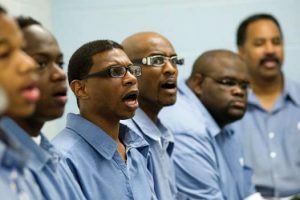 These songs were borrowed from, or crafted in the style of, the music of the Civil Rights, Peace, and Labor movements for their power when sung en masse to galvanize and connect activist communities. Creative choral arrangements by singer-songwriters Holly Near, Cris Williamson, and the nationally acclaimed a cappella quintet Sweet Honey in the Rock topped the charts of these early community women’s choirs. The songs empowered women to raise their collective voices to Take Back the Night, fight for reproductive rights, illuminate women’s health concerns, demand equal pay for equal work, and organize for the rights of lesbian, gay, and bisexual people. (1) Christopher Small, Music of the Common Tongue: Survival and Celebration in African American Music (Wesleyan, 1999 ), 55- 56. (2) Anna Crusis Women’s Choir just celebrated their fortythird spring concert Sing Truth to Power, Miriam Davidson, Artistic Director http://www.annacrusis.org/. 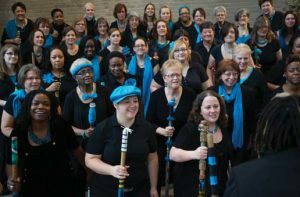 (3) Sister Singers Network is a cooperative web of feminist choruses and ensembles, composers, arrangers, and individual singers working together to support and enrich the women’s choral movement, http://www. sistersingers.net/. Catherine Roma is an American choral conductor and activist. She was a founding conductor and organizer of the US women's choral movement. 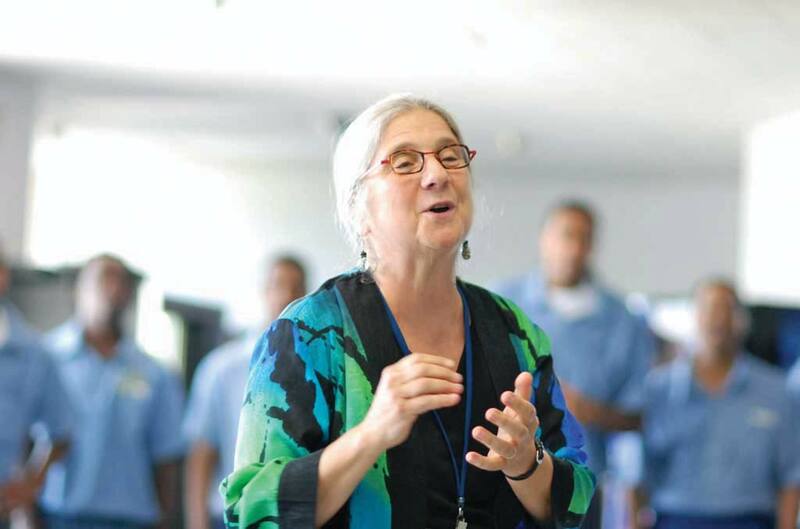 She founded the feminist Anna Crusis Women's Choir in Philadelphia, Pennsylvania in 1975, MUSE, Cincinnati's Women's Choir in 1984, the Martin Luther King Coalition Choir in 1992 and the World House Choir in 2012.